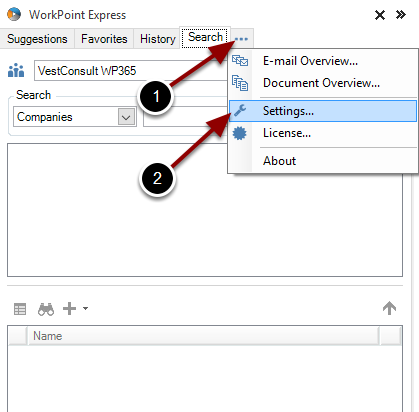 Centralized WorkPoint Express Settings Datastore – Welcome! How can we help? Since WorkPoint Express version 5.2.1.0 a centralized WorkPoint Express settings datastore is required. WorkPoint 365 customers and customers already using the centralized datastore are not affected by this change and can upgrade WorkPoint Express without any prerequisites. If you are unsure if you are all ready using our centralized WorkPoint Express datastore just follow the steps below to verify. Verifying the "Internal Datastore Url"
Verify that "https://wpedatastore.azurewebsites.net" is shown in the Url field. If you have the same Url as in the picture above, you are good to go and can update your WorkPoint Express. Please note that no WorkPoint Express system settings, favorites or any other user settings will be migrated using this approach. To migrate your existing data store to a centralized data store please mention this in your email. We will then assist you migrating your local datastore to the new centralized datastore.